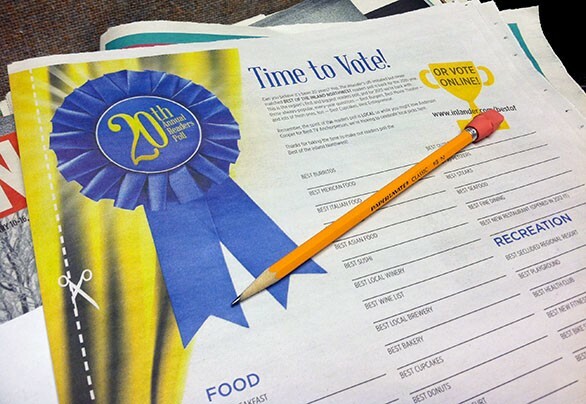 We wouldn’t let you down after 19 years — it’s time for the 20th Best of the Inland Northwest readers poll, with ballots online and in this week’s paper. Hopefully you’ve got it figured out by now, but there are always some questions that come up about how this all works. Here are some answers. Once a year. One ballot per person only – but it’s quite a bit of work, so one is probably enough. I don’t know all this stuff. Can I just vote for a few categories? Can I vote for the same person/place for more than one question, if they fit both? Yes. If you think the same place is the best wine bar, beer bar, sports bar and happy hour, for example, you should probably go out and try some new establishments. But, ballot-wise, that’s totally fine. We do get suspicious of ballots that have the same answer over and over again, and we reserve the right to reject any ballots that violate the spirit of the rules. How local is local? Does an athlete who used to play here and just got moved to the big leagues count? Does a chain store count if it’s locally owned? This is the readers poll for a reason — if you can justify your answer as local to the Inland Northwest, go ahead and put it down. Obviously Anderson Cooper is not a local TV anchorperson, and obviously LeBron James is not a local athlete. But John Stockton has won a few times, and of course he didn’t spend his whole life in Spokane. I can’t remember exactly what the place is called — does my answer count even if it’s not spelled exactly right? We go through the answers to figure out what you mean, so it’s not a problem if you misplace an apostrophe. But it needs to be close enough that we can be certain, so it’s not a bad idea to just look the place up real quick. Last year I didn’t agree with the winners, so I’m not bothering to vote this time around. OK, we can’t tell you what to do, but it’s a democratic poll — you can’t change anything if you don’t vote. And also like political elections, it doesn’t hurt to do some campaigning for a candidate you think deserves to win. Where do I get a ballot? There are printed ballots in this week’s issue (page 29), or you can vote online here. Paper ballots need to be postmarked by Feb. 20. Online voting ends at midnight on Sunday, Feb. 24.